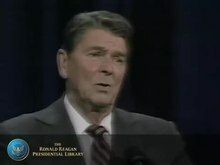 Reagan touted a strong economic recovery from the 1970s stagflation and the 1981–82 recession, as well as the widespread perception that his presidency had overseen a revival of national confidence and prestige. The Reagan campaign produced effective television advertising and deftly neutralized concerns regarding Reagan's age. Mondale criticized Reagan's supply-side economic policies and budget deficits, and he called for a nuclear freeze and ratification of the Equal Rights Amendment. Only three Democratic candidates won any state primaries: Mondale, Hart, and Jackson. Initially, Massachusetts Senator Ted Kennedy, after a failed bid to win the 1980 Democratic nomination for president, was considered the de facto front-runner of the 1984 primary. However, Kennedy announced in December 1982 that he did not intend to run. Former Vice-President Mondale was then viewed as the favorite to win the Democratic nomination. 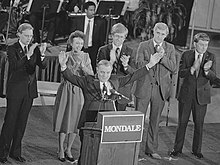 Mondale had the largest number of party leaders supporting him, and he had raised more money than any other candidate. However, both Jackson and Hart emerged as surprising, and troublesome, opponents. Hart, from Colorado, was a more serious threat to Mondale, and after winning several early primaries it looked as if he might take the nomination away from Mondale. Hart finished a surprising second in the Iowa caucuses, with 16.5% of the vote. This established him as the main rival to Mondale, effectively eliminating John Glenn, Ernest Hollings and Alan Cranston as alternatives. [ citation needed] Hart criticized Mondale as an "old-fashioned" New Deal Democrat who symbolized "failed policies" of the past. Hart positioned himself (just as Bill Clinton would eight years later) as a younger, fresher, and more moderate Democrat who could appeal to younger voters. He emerged as a formidable candidate, winning the key New Hampshire, Ohio, and California primaries as well as several others, especially in the West. However, Hart could not overcome Mondale's financial and organizational advantages, especially among labor union leaders in the Midwest and industrial Northeast. Hart was also badly hurt in a televised debate with Mondale during the primaries, when the former vice president used a popular television commercial slogan to ridicule Hart's vague "New Ideas" platform. Turning to Hart on camera, Mondale told Hart that whenever he heard Hart talk about his "New Ideas," he was reminded of the Wendy's fast-food slogan " Where's the beef?" The remark drew loud laughter and applause from the viewing audience and caught Hart off-guard. Hart never fully recovered from Mondale's charge that his "New Ideas" were shallow and lacking in specifics. Mondale gradually pulled away from Hart in the delegate count, but, as Time reported in late May, "Mondale ... has a wide lead in total delegates (1,564 to 941) ... because of his victories in the big industrial states, his support from the Democratic Establishment and the arcane provisions of delegate-selection rules that his vanguard helped draft two years ago." 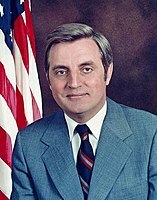 After the final primary in California, on June 5, which Hart won, Mondale was about 40 delegates short of the total he needed for the nomination. However, at the Democratic National Convention in San Francisco on July 16, Mondale received the overwhelming support of the unelected superdelegates from the party establishment to win the nomination. When he made his acceptance speech at the Democratic Convention, Mondale said: "Let's tell the truth. Mr. Reagan will raise taxes, and so will I. He won't tell you. I just did." Although Mondale intended to expose Reagan as hypocritical and position himself as the honest candidate, the choice of raising taxes as a discussion point likely damaged his electoral chances. Mondale chose U.S. Rep. Geraldine A. Ferraro from New York as his running mate, making her the first woman nominated for that position by a major party, and the first Italian American on a major party ticket since Al Smith in 1928. Mondale wanted to establish a precedent with his vice presidential candidate, although Tonie Nathan of the Libertarian Party was already the first woman to receive an electoral vote in the 1972 election. Another reason for the nominee to "go for broke" instead of balancing the ticket was Reagan's lead in the polls. Mondale hoped to appeal to women, and by 1980, they were the majority of voters. In a "much criticized parade of possible Veep candidates" to his home in Minnesota, Mondale considered San Francisco Mayor Dianne Feinstein and Kentucky Governor Martha Layne Collins, also female; Los Angeles Mayor Tom Bradley, an African American; and San Antonio Mayor Henry Cisneros, an Hispanic, as other finalists for the nomination. In addition to her gender, Mondale chose Ferraro because he hoped she would attract ethnic voters with her personal background. Unsuccessful nomination candidate Jesse Jackson derided Mondale's vice-presidential screening process as a "P.R. parade of personalities," but praised Mondale for his choice, having himself pledged to name a woman to the ticket in the event he was nominated. Mondale had wanted to choose New York Governor Mario Cuomo as his running mate, but Cuomo declined and recommended Ferraro,  his protégée. Mondale might have named Massachusetts Governor Michael Dukakis as his running mate had he wanted to make a "safe" choice",  while others preferred Senator Lloyd Bentsen because he would appeal to more conservative Southern voters. Nomination rival Gary Hart stated before Ferraro's selection that he would accept an invitation to run with Mondale;  Hart's supporters claimed he would do better than Mondale against President Reagan, an argument undercut by a June 1984 Gallup poll that showed both men nine points behind the president. The Reagan campaign was very skilled at producing effective television advertising. Two of the more memorable ads it produced were commonly known as " Bear in the woods" and " Morning in America". Reagan was re-elected in the November 6 election in an electoral and popular vote landslide, winning 49 states. He won a record 525 electoral votes total (of 538 possible), and received 58.8% of the popular vote; despite Ferraro's selection, 55% of women who voted did so for Reagan,  and his 54 to 61% of the Catholic vote was the highest for a Republican candidate in history. Mondale's 13 electoral college votes (from his home state of Minnesota—which he won by 0.18%—and the District of Columbia) marked the lowest total of any major presidential candidate since Alf Landon's 1936 loss to Franklin D. Roosevelt. Mondale's defeat was also the worst for any Democratic Party candidate in American history in the Electoral College (and his 13 electoral votes the fewest any Democrat has won since Stephen A. Douglas claimed 12 in the 1860 election, when the Democratic vote was divided), though others, including Alton B. Parker, James M. Cox, John W. Davis, and George S. McGovern, did worse in the popular vote. When Reagan was asked in December 1984 what he wanted for Christmas he joked, "Well, Minnesota would have been nice". 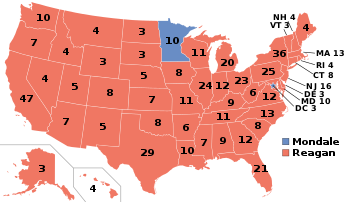 Reagan lost Minnesota in both this election and in 1980, making it the only state he failed to win in either election, and also making him the first two-term president not to carry Minnesota since Woodrow Wilson. 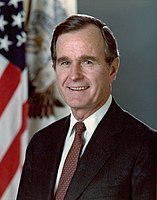 This is the last election where the Republican candidate achieved any of the following: Win every state in the Northeastern and Pacific regions of the United States; win at least one county in every state; and win any of the following states: Hawaii, Massachusetts, New York, Oregon, Rhode Island, and Washington. It was also the last election where the Republican nominee won Wisconsin until 2016, Iowa until 2004, the last election in which the winning candidate won by a double-digit margin in the percentage of the popular vote, and the last election where the winning candidate won by an eight-digit margin in total popular votes (10 million or more). 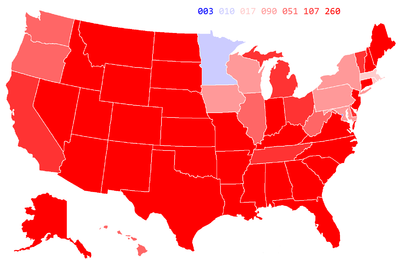 Finally, despite his narrow loss in Minnesota, Reagan still won in five out of its eight congressional districts (by contrast, Nixon had only carried one Massachusetts district twelve years earlier) thus making Reagan the only U.S. presidential candidate in history to win the popular vote in a majority of congressional districts in every state. "How close was the 1984 election?". Archived from the original on August 25, 2012. Retrieved April 3, 2010. CS1 maint: Unfit url ( link) Michael Sheppard, Massachusetts Institute of Technology.
" We begin bombing in five minutes"